Tanzanite the spectacular violet-blue gem is known for its beauty and rarity. The gemstone found in just one small patch of land on our planet, is believed to be 1,000 times rarer than a diamond. Buy a tanzanite men's ring for yourself and you present yourself as a true lover of nature's gorgeous and unique creations. Gift a men's gold or 925 silver tanzanite ring to someone, show them just how much you respect them for what they are. The MAN64T tanzanite ring for me showcases the tremendous gem, it is also a perfect demonstration of how high quality jewels should be designed and crafted. A men's ring needs to be more than good looking and pleasing to the eye, the jewel should incorporate features that lift the durability of the jewel. Available in gold and sterling silver this tanzanite gemstone ring for men, maintains the quality of design, craftsmanship and gemstone for both metal options. If you pick the gold tanzanite gemstone ring, choose from 14k or 18k gold and you can request for white, yellow or pink gold for the ring. There is a growing interest in 10k gold men's rings, we can send you a price quote if you choose to have your ring done in 10k white, yellow or rose gold. Available as a sterling silver or gold men's gemstone ring with good workmanship and gems. This ring can be ordered with the gemstone of your choice, design modifications are possible. The 2.5mm diamond on either side of the oval tanzanite can be replaced with gems of your choice. The ring is shown with a 9x7mm oval tanzanite gem, request for pricing if you need a 10x8mm oval gem. 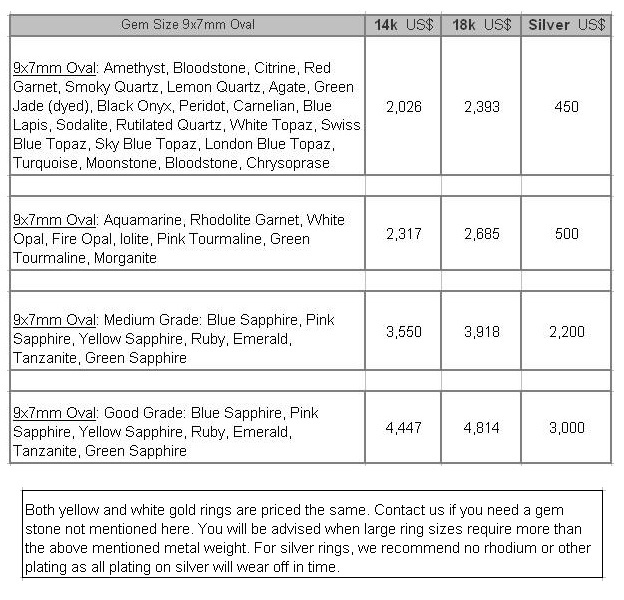 Since each men's gemstone ring is fully custom made, all ring size requests can be accommodated. A strong and long lasting ring is ensured by, investing substantial metal weight in the ring. The tanzanite gold ring weighs 20-25 grams, the silver ring has a weight of 15-20 grams. Larger ring sizes and a requirement for a solid ring with no scooping, might require more weight. Tanzanite is 1,000 times rarer than diamonds and found in just one small location on our planet. The birthstone charts list tanzanite as the birthstone for the month of December. A small patch of land at the foothills of Mount Kilimanjaro is the only place where tanzanite is found. The gemstone is named about the only country in which it is mined, Tanzania. Experts agree that this gorgeous gem is at least 1,000 times rarer than diamonds. The exotic color of medium and dark color tanzanite looks awesome in all metal colors. In the year 2002, the birthstone charts were updated to include Tanzanite as a December birthstone. Tanzanite is a highly sought after gem for men's and women's rings. The beauty and rarity of the gem makes it perfect for a self purchase or as a gift. How To Buy: Fine jewelry like that crafted at Kaisilver is best purchased after discussing details with a real support team. Our handpicked team of experts are knowledgeable in all aspects of gem procurement, gem cutting, jewelry design and production. Contact them at sales@kaisilver.com and avail of their expertise on any issue related to gemstones and jewelry. Since all jewelry is completely made to order, we can accommodate all design requests and can also work with your own design image or sketch. Expect a production time of 4 to 6 weeks from the date of order confirmation and receipt of payment. Paypal and Western Union are the preferred payment modes but, we would strongly recommend Paypal for first time buyers. Update us on the mode of payment that is suitable for you and we will provide details for the same. Shipping is through FEDEX with web tracking, a 35 U.S$ shipping charge will generally cover expenses for most destinations. Our team will let you know whether it is possible for us to bear your shipping charge before, you confirm the order with payment. Kaisilver: As the leading online global provider for high end custom made jewelry, we at Kai Silver craft all types of jewelry in gold or 925 sterling silver. Preferential access to some of the largest gem resources most which, involve gem mining operations allow us to place no restriction on your choice of gemstones. Choose from our designs or request for a custom jewel to be made with your own design concept or image. Send us your questions and requirements at sales@kaisilver.com we will be glad to help even if, you decide not to purchase anything from us. Buyers Feedback: I just wanted to tell you how thrilled I was with the ring I ordered from you. The anxiety I felt due to the delay in receiving it it due to the flooding in your country last fall was immediately relieved when I saw it. I burst into tears in joy. It is absolutely beautiful and I could not ask for more. All the custom aspects I requested were completed with perfection. It was more fabulous than I had dreamed. Thank you so very much! Sincerely, Ms.L.Kennedy .... more. Gold and silver tanzanite gemstone rings for men and ladies, our custom tanzanite rings can be made according to your design or ours. Our gems are sourced directly from the Tanzanian mines with no middlemen to add commissions and multiple layers of profit. 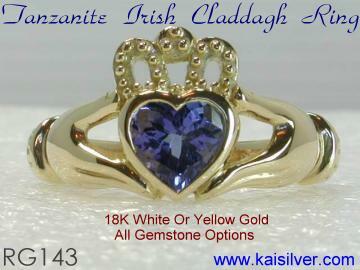 The image shows a fine claddagh ring with a heart shaped tanzanite gem. This four century old ring is believed to be the most meaningful jewel in history. First made by an Irish slave for his beloved, the ring symbolizes love, togetherness and loyalty. We custom make claddagh rings with a gemstone of your choice, for men and ladies ... more.